Herein lies the real advantage of traveling on one's stomach. If food is the focus - if a memorable meal makes your day and a lovingly prepared plate is your visual equivalent of a breathtaking sunset - then beauty can be found almost anywhere. We have found beauty in the ugliest places. We found it in Medan, Sumatra's largest city, on the way to the Brayan (a district of Medan) morning market. Lontong Nasi Gurih is not a shack. It's less than a shack, just a tent-shaded streetside stall surrounded by a jumble of tables. Our motorcycle pedicab zoomed by at 7am on a Sunday, and Gurih was packed. We returned, headed the opposite direction, 4 hours later, and the place was still heaving. We asked our driver to turn around. Gurih serves its nasi lemak on a banana leaf. Sadly, many places no longer do. The leaf's subtle perfume rises when hot rice hits. Nasi lemak served on plastic or waxed paper is an abomination but, these days, an almost unavoidable one. Gurih bucks the trend. The nasi (rice) is perfect. Steamed in coconut water - not milk or cream - it is scented with, rather then overwhelmed by, coconut. It's not heavy, it's not gloppy, and it doesn't clump. Mushy nasi is a bummer. Here, each grain is distinct, individual , cooked through, yet the teeniest bit firm. As it should be. 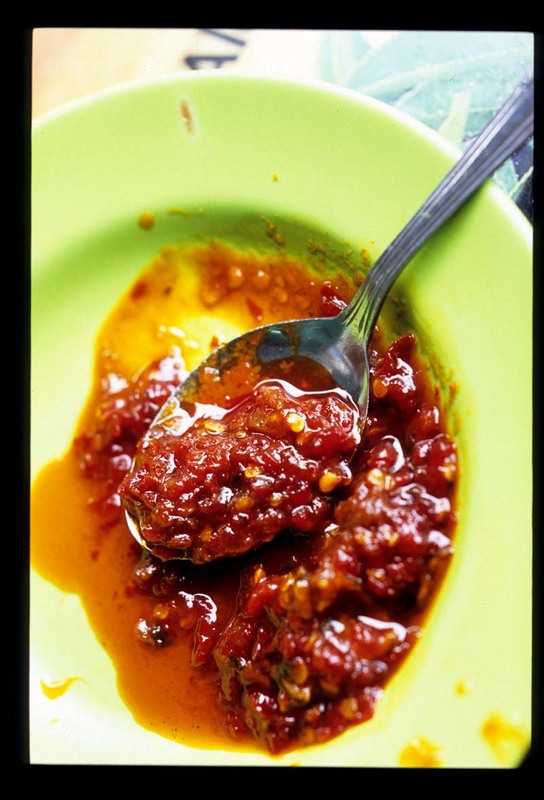 Gurih's sambal is exquisite, unbeatable, worthy of worship, spicy-hot (most foods on Sumatra are), but so much more. Sweet, from palm sugar perhaps, but also from sweetness coaxed from onions and shallots cooked low and slow until golden. It's fresh-tasting, because it's made not from dried chilies but from the plump, long red and green chilies that Sumatrans favor. There's a wee bit of sweet-balancing sharpness from tomatoes and the barest hint of fishiness from trassi (Indonesian shrimp paste). We called for seconds. The place dishes up delightful curries. The beef rendang's (lower left corner, both nasi lemak photos) deceptively mild come-on is quickly followed by a numbing chile punch. There's mellow sayur masak lemak (vegetables cooked in coconut milk - here, long beans, cabbage, and long green chilies) to soften the rendang's blow, and sprinkles of crunchy peanuts (skin-on, deep-fried) and fried shallots. The plate is finished by thin-cut, uber-crispy banana chips. Who doesn't love chips? 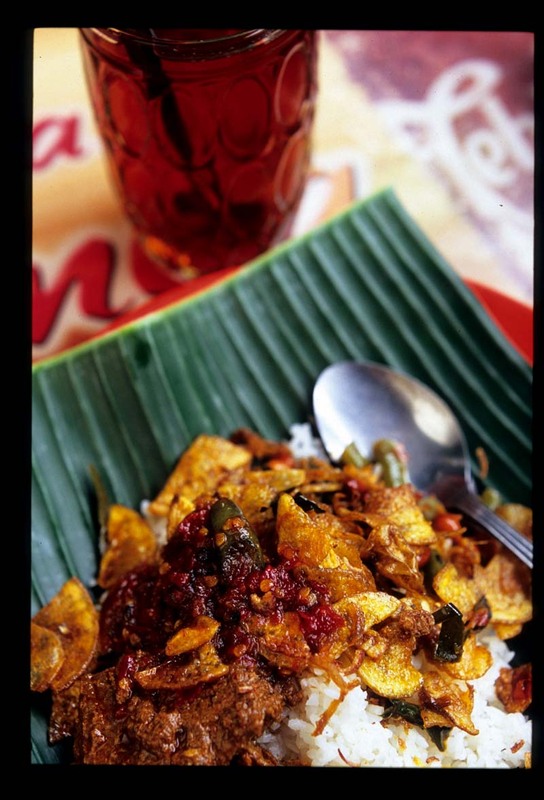 These lend an unusual (to those accustomed, as we are, to Malaysian ikan bilis-garnished nasi lemak) but very appealing textural element to an already amazing feed. We missed the ikan bilis - for about two seconds. Medan on a plate. What a lovely town. Can't wait to return. 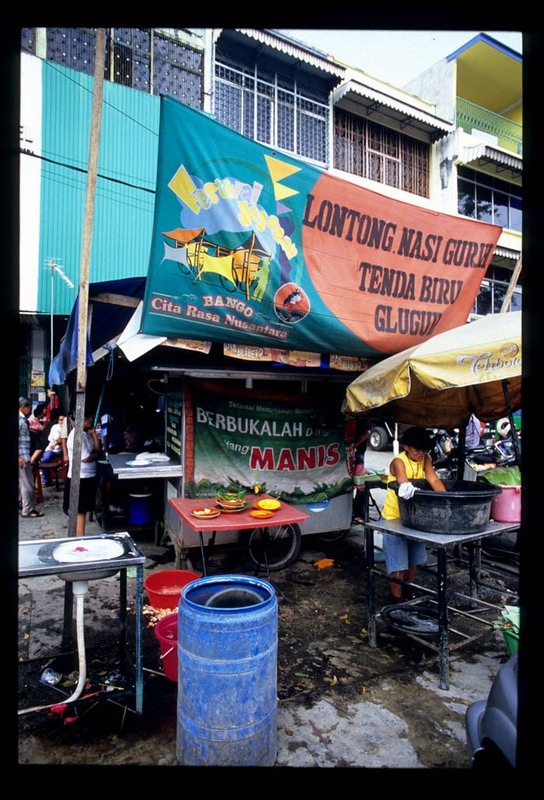 Lontong Nasi Gurih (yes, they serve lontong too, and it's wonderful - but who could pass up the nasi lemak? ), Jalan K.L. Yos Sudarso, Glugur District, Medan, Sumatra. 7am-noon and 6-10p. Tel. 662-0945. Arggg.... you make me feel so hungry!!! I agree. Robyn, it is almost a crime to showcase such wonderful food. 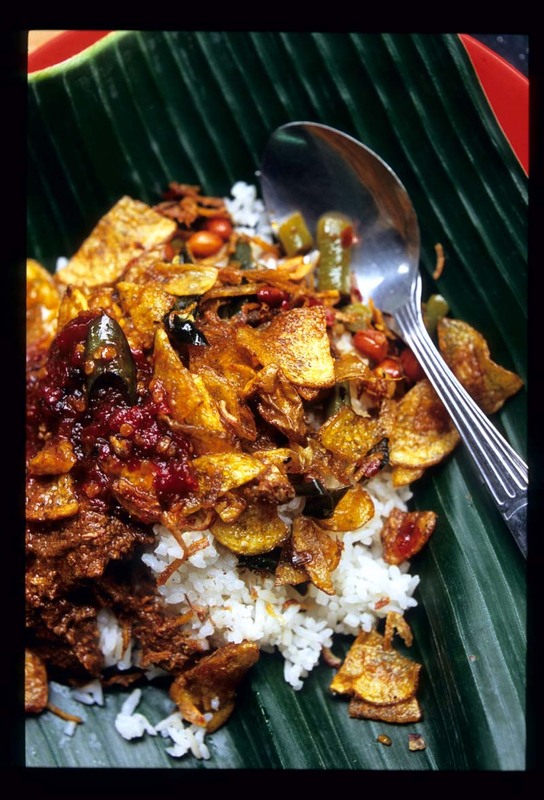 Now regular nasi lemak is almost off limits - we must have Medan-style! That sambal is so mouthwatering. in the philippines, chicken inasal is also served in banana leaves. what's more, steamed rice is wrapped in such leaves leaving it sweetly scented. The nasi and sambal, together, alone, would suit me just fine. That's sort of my thoughts about Orange County, California. Just because I'm surrounded by soulless suburbia doesn't mean good food isn't to be found. An excellent sentiment and well expressed. Wow!! Those are awesome pics. This is my kinda place. Absolutely love it. Good post. Ari - absolutely! Kinda wish they did nasi lemak this way in Malaysia. Lovely article. 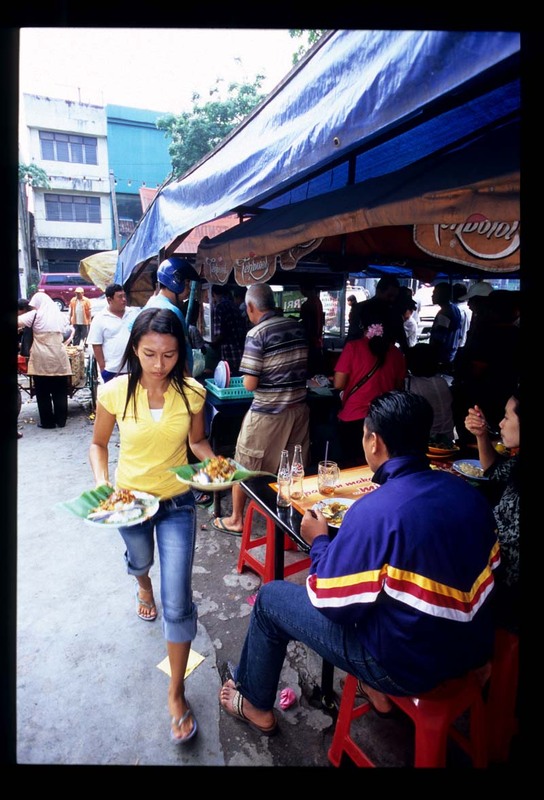 i am visiting Medan myself in a few weeks time and was wondering if you could recommend a hotel or hostel which is centrally located..